So. Olivia has always LOVED art. Anything involved with coloring, painting, writing, drawing, etc. She loves it. She was a daycare kid and did art projects daily. The Dudes are not daycare kids (seriously~who can afford daycare for 3 kids?!) and I have had some feelings of guilt because they do not do art everyday. Truth is the mess stresses me out. They used to eat the crayons. It was just a disaster. I am trying to put my issues aside and let them make messes. My friend Megan is wonderful about letting her kids make messes and be creative. I'm a work in progress. So when Olivia asked earlier this week if she could paint instead of my normal automatic "No" or "Wait until your brother's are sleeping" I said Yes. I surprised Olivia. I surprised myself. The Dudes had been given some toddler paint daubers as a gift a while back. I was to nervous to let them try. So I covered the table, busted out the paints and some coloring books and let the kids go. The kids had the time of their lives. About 45 minutes into it Owen and Olivia lost interest and went outside to play. 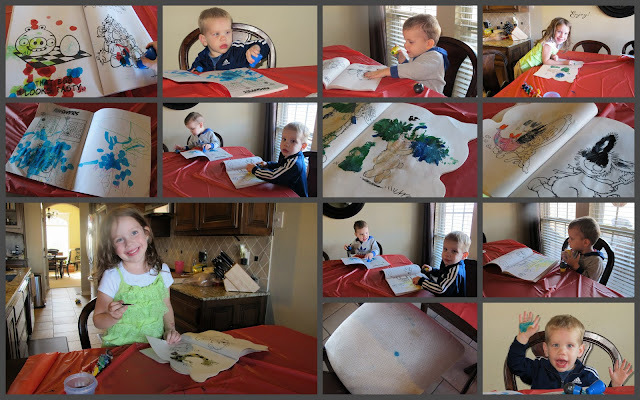 Carter sat at the table for nearly an hour and a half painting. I was shocked. The kid loves art. He loves coloring, painting, writing....he is getting exposed to more of this at Mother's Day Out and I'm so glad. I need to work on it at home. I'm trying people. I'm trying. Needless to say the kids had a great time. Olivia has asked several times since then if they can paint again. The only hitch to the afternoon? That toddler paint that the Dudes used? Not exactly as washable as the packaging led me to believe. Owen and Carter looked like weird living art exhibits for a day or two. Naturally Owen used blue and so he had faded blue on his face that resembled bruises. I'm sure people probably think I beat the snot out of that kid. Poor kid. If you will notice the picture of a chair seat with a single blue dot. That is the only casualty to the painting party. One blue dot on a chair that I was able to clean up much easier than I was able to clean my kids.